This is why I keep so many reeds around. Not because I ever thought I would want to use this misbegotten looking thing in public, but because today it was unexpectedly the best reed in my case for the task at hand. That task was playing Stravinsky's Petrouchka, a piece filled with aggressive articulation for the oboe and loud tutti sections that don't need to feature me but which I would like to be able to blow through. We were on stage at the Morris, a fairly dead stage that requires a very resonant, not to say buzzy, reed to project on, on an unusually cold and crisp day in spring that rendered all of my "good" reeds mushy and small. My students know that I get on them when they have just one reed in their case - anything could happen to that one - and three is much safer, but twenty is safer still. After all, you only need one reed - but it has to be the right one. Incidentally, we are performing Petrouchka this Saturday in South Bend, along with Beethoven's Emperor Piano Concerto (no. 5) and it's our final concert of the season and I am very excited about it. Click HERE for tickets and information. This weekend's Super Size Symphony concert is logistically INSANE - but I really am kind of excited to play the finale of Beethoven's Ninth Symphony with SEVEN HUNDRED people on stage. I can't imagine what this will be like, but I encourage attendance. Something thrilling is bound to happen. I got up at 5:30 am on a recent Tuesday. I had come in at 11 the night before after teaching 9 students in a row, and driving home, and so obviously had not gotten much sleep. The gig I was on my way to was an education concert that did not have a lot going for it, from my perspective - a trip through American History with peripherally related orchestral music and amateur actors. We were playing in an elementary school in Nowhere, IN, and there were two shows in a row for the same money as one. I was playing English horn, which is something I love to do, but the downside of the EH is that you spend a lot of time sitting around waiting for your piece to come up, which is NOT something I like to do. I'd rather be playing. The school was a solid two and a half hours from my house, and the orchestra is a great group, but not one of my usual ensembles so I was basically out and driving before the sunrise to count rests with strangers for a bunch of ten-year-olds who did not want to listen to us. This gig was really just about the money, and honestly everyone must have days like that, right? Anyway, I was in the middle of the second show, sitting in the orchestra waiting for my final piece (John Williams Liberty Fanfare - great material but not an English horn feature, to say the least). The orchestra was zooming through the Overture to Candide, in which I don't play, and all of a sudden I felt a tremendous rush of well-being and satisfaction. Yes, the morning's service was not one of the more spectacular moments of my career, but isn't it great that I can be sitting in the middle of an ensemble, enjoying this wonderful music, being a part of things, AND make my living? I could be actually working - digging ditches or cleaning houses or telemarketing or turning tricks - but instead I am being paid to perform. I wonder if the amount of energy and hassle that it took to get me to that point in the morning was a factor in my feelings? Last week I headed out on a long run. I think I've mentioned that I've been struggling through my runs lately - I love getting through them but the actual running part has been more of a drag than a pleasure. This time, though, after the first forty-five minutes, I got a fabulous second wind and zoomed through the remaining fifteen or so LOVING the endorphin rush. I had forgotten over this long winter that the best part of the run happens AFTER the first five miles, so when I get discouraged and head home after four, which is what has been happening, of course it doesn't feel fun. Maybe it's all of the effort that really makes the payoff magical, in life as well as exercise. I am struggling this week to be the Unfussy Oboist. This is my outside-the-house persona, and I'm proud of it, but it's also a personal standard that is often hard to live up to. I have to remind myself constantly that it is worth the work, and be vigilant about my own behavior in rehearsal and performance. This week my issues were sound and pitch. We played the Schubert Unfinished Symphony, which is delicate and features a lot of solo oboe and clarinet doubling. This is inherently treacherous as oboes and clarinets have very different sounds and pitch and timbre tendencies, and made all the more difficult by the fact that our principal clarinetist is AWESOME and really turns lovely nuanced phrases at extremely soft dynamics which I want to support and blend with. This is a situation where the oboe really shouldn't sound like an oboe, so I needed a great reed and a lot of control to make just the right tone. 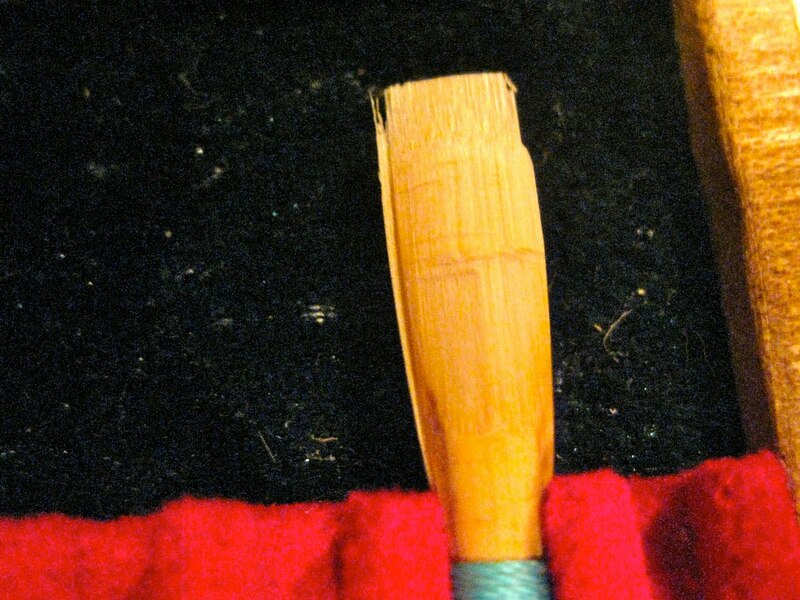 The Unfussy Oboist does not spend her whole rehearsal period on reeds, though - she plays on the reed du jour and makes it work. So I was busy before and after rehearsal trying to make the right sound but I forced myself to not switch reeds or scrape and fuss during the piece. In the end, the reed I went in with was not the reed of a lifetime, but all the audience needs to know is that it works - no one is interested in how much work I have to do inside my mouth to make the effect happen, and my colleagues aren't interested in that either. A couple of fake fingerings and some really alert ears got us through very successfully, I thought. We also played the Brahms German Requiem, and we had a great choir - a huge choir, drawn from the local colleges and the community, and they sounded terrific. They were good and loud, so tiny dynamics were not so crucial. Unfortunately, with a huge choir comes a huge pitch band - they sound like they're in tune but it's very hard to tune with them - and they tend to go flat, which makes us sound sharp, and high wind players are sensitive about being sharp, so the principal flutist and I had been pulling our hair out throughout the week trying to place our notes somewhere that felt comfortable. And no place did. Eventually, in the dress rehearsal today, we resolved to just play - to focus on each other and on our colleagues insofar as we can hear them - and sure enough, the effect tonight was far better than the sound we had been making trying to chase the pitch and each other lower and lower. When we trusted ourselves to be at pitch our instruments worked better, and our personal sounds and internal intonation were better, and I think we were more reliable pitch centers for those seated around us, so on the whole the performance was far better than the rehearsals had been. The Unfussy Oboist to the rescue! It is so easy to let the neurosis take over. The oboe is such a finicky instrument, and the reeds are so personal and so changeable, and so much about playing well is about this obsessive attention to oneself and the details and minutiae of sound and timbre and articulation and dynamic. I can spiral down into self-loathing in nothing flat, and plenty of players I know can work themselves into a frenzy about their reeds or their colleagues or the temperature on stage or the conductor or any of a zillion little things. My personal resolution is to keep that aspect of the job in the practice room - to take what I do seriously but to not let anyone see me sweat - and although I've been playing professionally for years I still struggle sometimes to keep the Unfussy Oboist front and center when I'm out in public. She may be more of an ideal than an actuality, but having that goal has made me a better player - better in the long term, and sometimes in the immediate term a better player than I am. If I pretend that everything is going smoothly and that I can easily play the material in front of me, things just work out a surprising amount of the time.